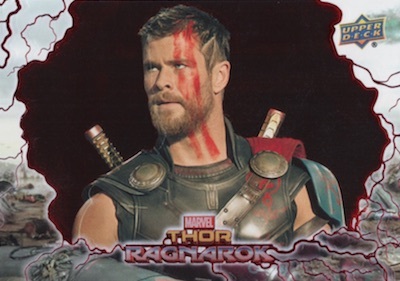 The vast Marvel Cinematic Universe gives way to 2018 Upper Deck Thor Ragnarok trading cards in celebration of the star-studded film. Collectors can likely expect one rip card, one memorabilia card, and one other hit to emerge from each hobby box. 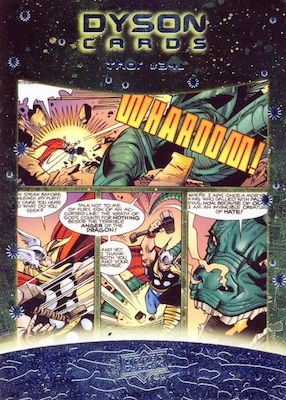 Of course, Chris Hemsworth reprises his role as Thor (sans the long locks) in the blockbuster 2017 film that offers the third Thor installment. 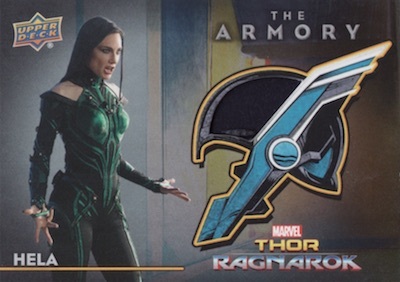 While Thor: Ragnarok follows Thor: The Dark World from 2013 (and its UD set), the events pick up two years after Avengers: Age of Ultron, which also has an Upper Deck card release. 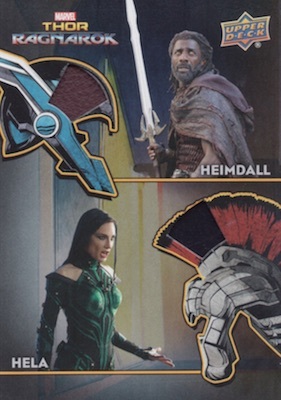 Using movie stills, the base set in the Upper Deck Thor Ragnarok checklist features 50 cards. There are also two LTFX foil parallels to chase. 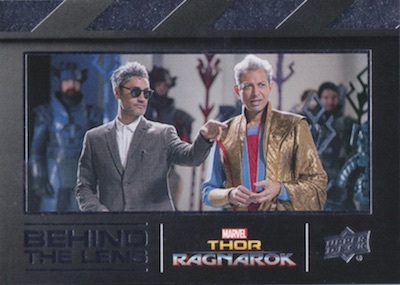 Inserts provide other film information with a focus on main characters and a behind-the-scenes look at the movie, including Behind the Lens, Grandmaster's Contenders and Mistress of Death. 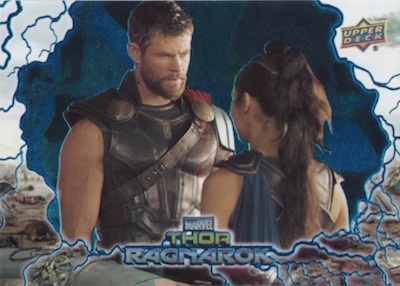 In addition, hits are a huge part of 2017 Upper Deck Thor Ragnarok. 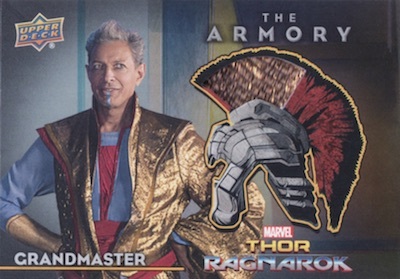 The main actor Stars of Sakaar Autograph cards are joined by the new Grandmaster's Prized Possessions Actor Autos, which include chain strands in the card. 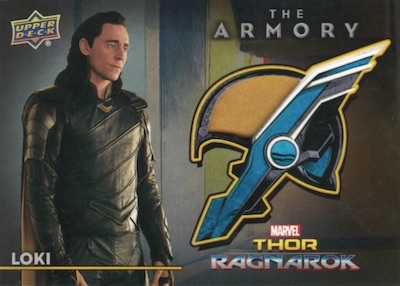 Averaging one per box, The Armory Memorabilia cards come with authentic pieces from items used in the film's production. 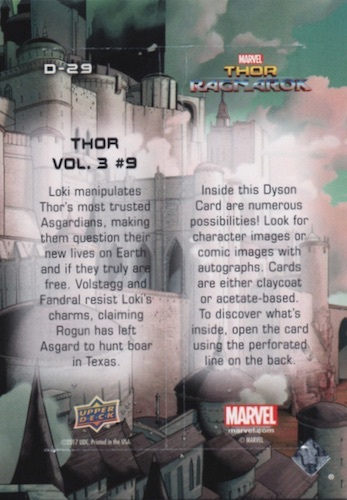 Debuting for collectors, the one-per-box Dyson Rip cards hold a mystery, similar to the Dyson sphere (Muspelheim) where Thor is imprisoned. Mini cards or even Mini Autographs could be waiting inside. Rounding out the premium choices are hand-drawn Sketch cards. 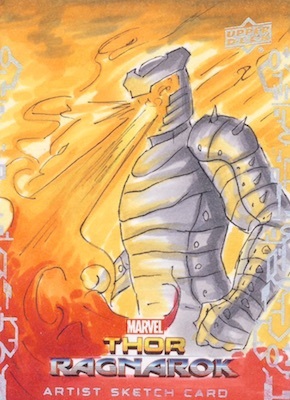 2018 Upper Deck Thor Ragnarok sketch by Natasa Kourtis 1 1 UD Sketch Card! 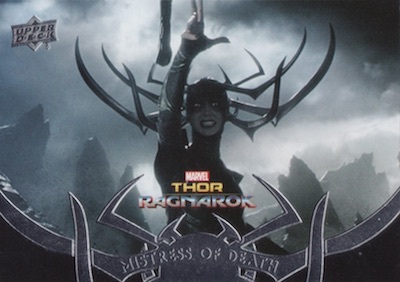 Hela! Pack Odds Key: h = Hobby, e = ePack. PARALLEL CARDS: Red (1:2.5 h/e), Blue #/199. 8 cards. 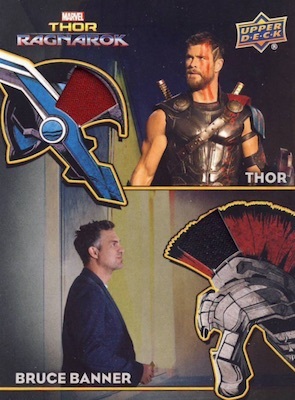 Shop for Thor Ragnarok autographs on eBay. Individual group odds listed below. BTL13 May I Have This Dance? 5 cards. Serial numbered #/100. 3 cards. Serial numbered #/15. 30 cards. 1:2 Dyson Rip cards. 5 cards. 1:39 Dyson Rip cards. 23 cards. 1:6 Dyson Rip cards. 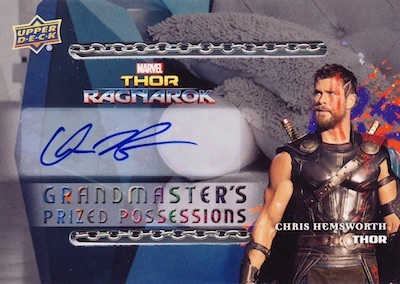 Good: Chris Hemsworth autographs; base cards look fantastic; Dyson cards are interesting. Bad: Missing other big cast autographs; relic design is a little bland and the pieces are small. 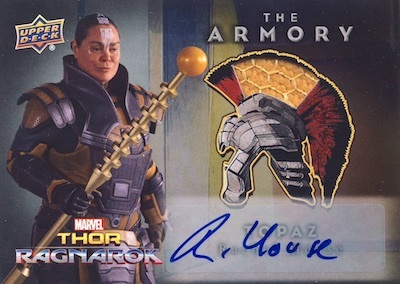 The Bottom Line: Offering autographs for the title character from a blockbuster movie, Upper Deck Thor Ragnarok would be notable for that alone. Although it would have been nice to have some big signers other than Hemsworth, the appealing designs and premium aspects really help increase the overall experience. 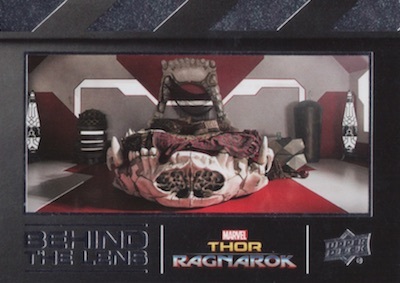 So, I really like the Upper Deck Thor Ragnarok base design. 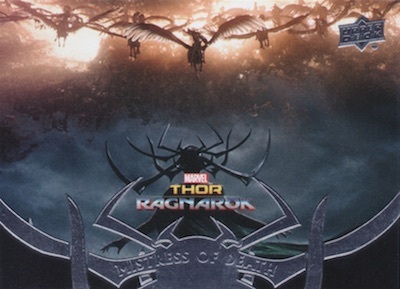 The card uses a stock frame but you almost don't notice since the movie image enhanced with foil dominates focus. I particularly enjoy the way the foil spreads into the frame via the lightning bolts. I normally don't care for splashes of color on these styles, but something about the red and blue parallels really catches the eye as it fills the main background and lightning, minus the subject image. In that regard, it can highlight things very nicely. 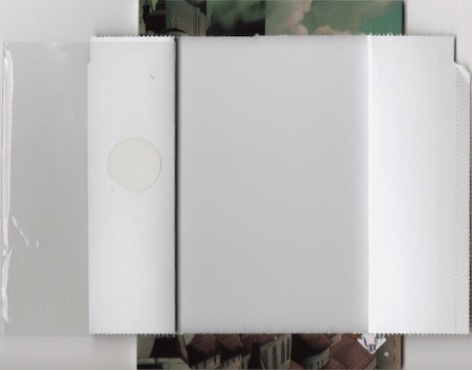 For the inserts, Behind the Lens is the least exciting and the most common. 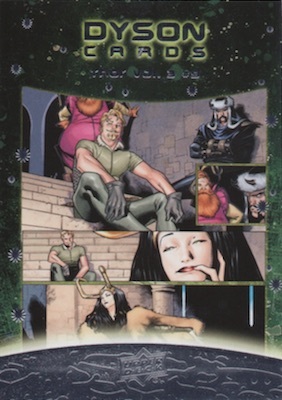 Grandmaster's Contenders and Mistress of Death, which incorporates the antlers in the foil design, both look better but are much more rare at roughly 1:2 boxes. 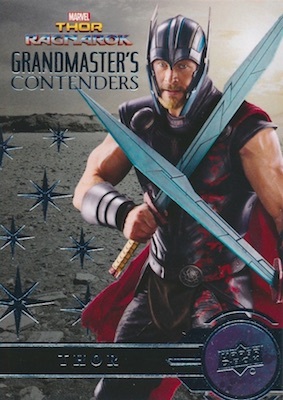 The review boxes yielded two Mistress of Death cards (one in each) but zero Grandmaster's Contenders. While rip cards are not new, the Dyson cards can be amusing. 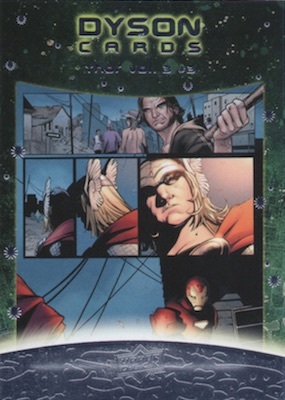 The comic-style front ties in another element to the franchise, and offers potential extras (if you decide to rip) that can add to the box hits. Admittedly, it would be nice if UD went with on-card signatures for their entertainment sets. 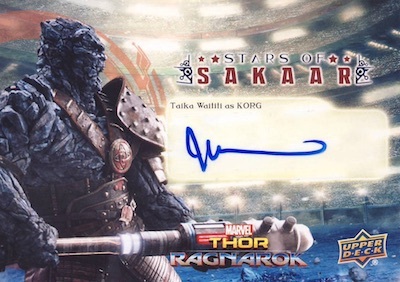 While the main Stars of Sakaar autograph design is solid, the stadium background is a little disappointing and I wish the look matched more to the base set. 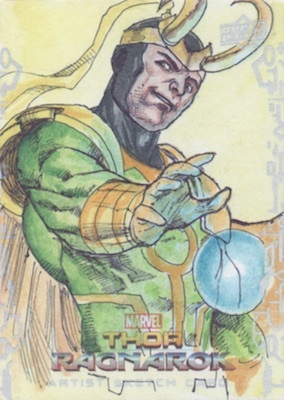 I thought the Grandmaster's Prized Possessions autographs, with embedded chains, worked better from a design perspective. With at least one per box, the memorabilia designs are not as strong for me. Like the main autographs, they don't feel as much a cohesive addition. The relic cards are also more generic looking. Without print runs, there is no way to really know how many cards we are talking about, but the swatches used (at least the visible portion) are pretty small, especially on the multi-subject cards. Chris Hemsworth makes this set. Without his autographs, the whole equation changes. 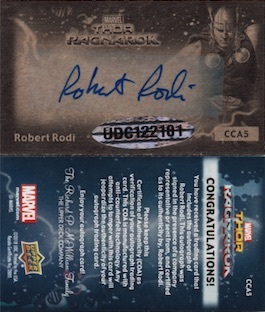 Still, after Thor, the lineup is pretty sparse with only three other actor autographs in the entire set. Although Rachel House (Topaz), Tessa Thompson (Valkyrie) and Taika Waititi (Director/Korg) are decent additions, the other possibilities are staggering. I have no doubt Upper Deck tried to get them, but it's hard not to imagine if just one or two (let alone even more) of the other big names were in this set. Choices include Anthony Hopkins, Benedict Cumberbatch, Cate Blanchett, Idris Elba, Jeff Goldblum, Karl Urban, Mark Ruffalo, and Tom Hiddleston. Dang. 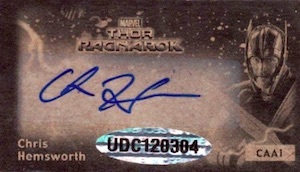 Just like he dominates the checklist talk, Thor is the main reason for the value, with his autographs selling for $250+. In a box that runs about $90-100 (at the time of this review), that's a substantial value possibility. 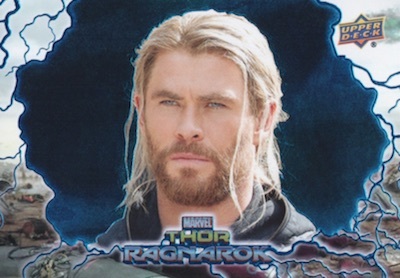 Obviously, pulling a Hemsworth autograph is unlikely but the three hits in a box help value, as well. Since one is likely to be a Dyson rip card, that leaves open the chance to add a fourth hit with an autograph inside the rip, like our first review box had. 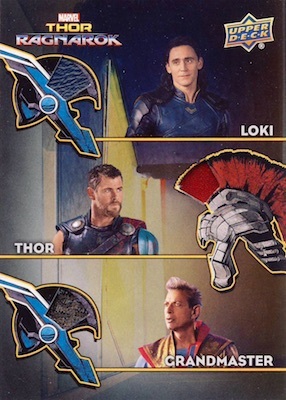 I thoroughly enjoyed Upper Deck Thor Ragnarok. Since we opened two review boxes, it was nice to see a little variance in the outcomes for each. Of course, an actor autograph would have been even better, but box 1 had a comic artist signature in the Dyson, and box 2 delivered a sketch. I did not open the rip card in box 2, but most likely it's a standard mini card. The boxes used for this review were provided by Upper Deck Entertainment. Hi, any checklist? still same date? Thanks! As soon as we have the checklist, it will be added. Date is accurate as of now but changes are always possible.